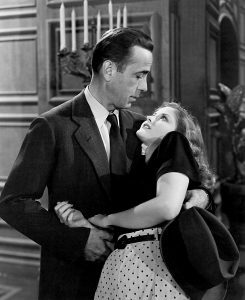 Phillip Marlowe (Humphrey Bogart) and Carmen Sternwood (Martha Vickers) in a scene from The Big Sleep (1946). In this episode: Scott explores the dark streets of one of the most overlooked genres of chivalric literature – the private eye story – with author and publisher Charles Ardai. Mr. Ardai is founder of Hard Case Crime Books, and his short story The Home Front won an Edgar Award in 2007 for outstanding mystery fiction. Mr. Ardai recently uncovered a rumored (but long-lost) manuscript by James M. Cain, one of the pioneers of early 20th century detective fiction (along with Dashiell Hammett and Raymond Chandler) called The Cocktail Waitress, which he is currently editing and preparing for publication. Donate to Chivalry Today and get some great appreciation gifts as part of our Sixth Season “Choose Your Rewards” donor appreciation program. 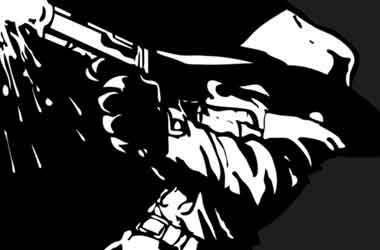 Bill Waterson’s cartoon character Calvin occasionally played the role of a make-believe detective “Tracer Bullet” in the comics. Now at first you might wonder what private eyes and urban crime stories have to do with discussions of the code of chivalry. But scratch the surface just a little bit, and you’ll find that hidden under that trenchcoat, “roscoe,” and fedora is, in fact, a knight in shining armor. Consider: In early drafts of Raymond Chandler’s work, detective Philip Marlowe was named (instead) Philip Malory in homage to the Arthurian tales written by Sir Thomas Malory in the 15th century, which inspired Chandler’s writing. And in an article in The New Yorker in 1931, literary critic Dorothy Parker compared Dashell Hammet’s detective character Sam Spade to Sir Lancelot. In fact, the connection between the knightly characters of the Age of Chivalry and the hard-boiled detectives and private eyes of modern crime fiction is pretty clear, once you start looking for it. The black knights and evil sorceresses may have become mob bosses and femme fatales, but in both cases these are stories of heroes struggling to follow a code as they move through a dark world of temptation and corruption in a quest for justice. So just what do private eyes and detective stories have to teach us about the ideals of chivalry – in both literary tradition and real life? Are these stories that reaffirm the presence of a code of honor on the hard city streets? Or do we come away with the message, to paraphrase Philip Marlowe in The Big Sleep, that “knights have no meaning; this world isn’t a place for knights”? In this episode, Scott speaks with author and crime novel expert Charles Ardai about the character of the private eye and the code of chivalry. Read an essay about themes in The Big Sleep (including images of knights and ideals of chivalry) by Robert Moss on a website dedicated to analysis of Raymond Chandler’s writing.